Welcome to the Boy Scouts of America, Alamo Area Council. On behalf of the 18,000 youth located in Bexar and the 12 surrounding counties in our council service area, thank-you for choosing to become a leader. Your leadership will help shape the lives of countless numbers of youth in years to come. A direct contact Scout leader is considered fully trained and able to participate in the Scouting program with youth when they have completed the required trainings for their position. The Training section of this site is designed to guide you and your unit along the path to reach Trained status. We as your district and council volunteers and staff, are here as a resource to provide you with the skills and knowledge needed to make your experience as a volunteer in the Scouting program, an enjoyable one. Training throughout the year is conducted on both the District and the Council levels. The Boy Scouts of America believe that every Scout deserves a trained leader. We also believe that every leader deserves to have access to the knowledge that will enable them to develop the confidence to serve as a role model and mentor to the youth in our program. To learn more about training, please reference the training section found at www.AlamoAreaBSA.org/Training. 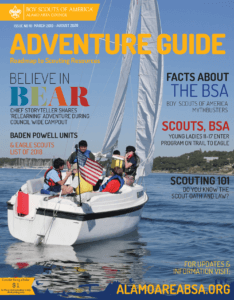 Scouting has many events that a scout can attend every month. Please review our website for adventures and trainings offered.